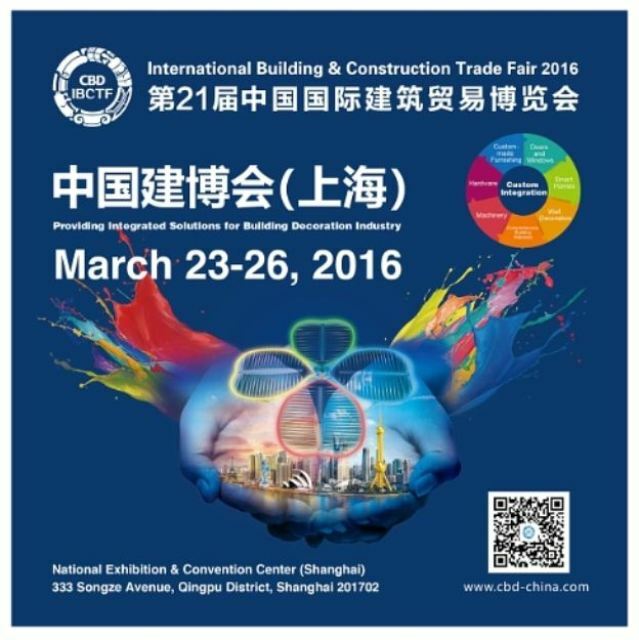 The 2016 International Building & Construction Trade Fair ("CBD-IBCTF (Shanghai)"), will run from March 23-26, 2016 at the National Exhibition and Convention Center in Shanghai. The 2016 International Building & Construction Trade Fair, or CBD-IBCTF (Shanghai), will open on March 23, 2016 at the National Exhibition and Convention Center in Shanghai. CBD-IBCTF (Shanghai) will cover an area of 100,000 sqm, and include 600+ exhibitors and 40,000+ attendees in 2016. The fair offers a comprehensive and professional platform for the building decoration industry that has a strong global influence, centering on the philosophy of "custom integration and cross-over development." It will cover various themes from custom home furnishing, doors & windows, decorative hardware to wall decorations. CBD-IBCTF (Shanghai) will focus on customized home decoration as well as doors and windows. By gathering new exhibitors from northern China and abroad, the fair has great potential to reach wider markets and reveal new business opportunities. Pavilion 1 will include al-ally doors & windows, with European-style tall furniture from famous brands including Kefan, Aiegle and Ratoup. Wooden doors from Goldea, Cimen and Mansfield Group will showcase in Pavilion 2. Pavilion 3 will gather companies offering integrated customization, with half of the space featuring wardrobe and closet manufacturers. CBD-IBCTF (Shanghai) is hosted by the China Foreign Trade Centre and the China Building Decoration Association. The Fair debuted in 2015 at the National Exhibition and Convention Center in Shanghai. CBD Fair (Guangzhou) has been providing professional services for the entire building decoration industry chain for 17 years. To meet the growing demands of exhibitors from Shanghai and northern China, the organizing committee decided to expand the scale of the event, and since 2015 the fair has been held twice a year, in Shanghai in March and in Guangzhou in July. "CBD Fair (Guangzhou) is now Asia's No.1 building and decoration industry fair, known as the premiere platform for professionals and experts in the industry," said Mr. Li Deying, president of the organizing committee. "CBD-IBCTF (Shanghai) can fully utilize Shanghai's advantage as an international metropolis and is in line with industry development, focusing on doors & windows, as well as decorative hardware, to gradually cover the whole industrial chain of building decoration."